Georgi Ivanov Sensei (4th dan) is born on 3rd February, 1958, in Silistra. In 1972 he started practicing martial arts. Being a student of one of the most celebrated Bulgarian choreographers (People’s Artist Dimitar Dimitrov – Palavrata) and a graduate of the Bulgarian National Institute of Choreography in Sofia, Georgi Ivanov Sensei worked as a professional choreographer for ten years. 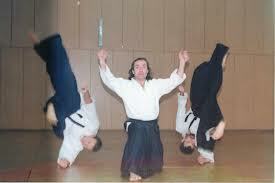 In the 1980s he taught folk dance while commencing his Aikido practice. In 1986 he started teaching Aikido together with G. Penev. 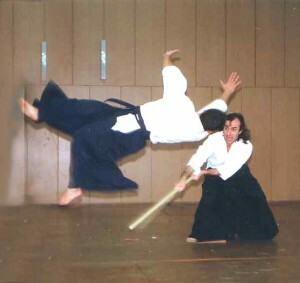 In 1988 he started to teach independently and by that time Aikido became the center of his life. After the establishment of the Bulgarian Aikido Federation (BAF), Georgi Ivanov Sensei was elected president of BAF. In his capacity of a president, he organized many seminars with masters like M. Fugita, Y.Yokota, J. Veneri, Vilaverda, P. Goldsbury etc. Due to his persevering efforts to teach and popularize Aikido, as well as due to the overall BAF policy during those years, BAF was associated to EAF (the European Aikido Federation). Later the same year, BAF got associated to IAF (the International Aikido Federation) as well, and got acknowledged by Hombu Dojo. At the World Games in the Hague in 1993 (“Olympic” games for the non-Olympic Sports) he led the team of the BAF representatives. They were among the best on the seminar and the demonstrations held on the Games. Being a choreographer on the one side, and an Aikido teacher on the other side, Georgi Ivanov Sensei managed to combine the teaching methods for folk dances and those for Aikido. By that time this phenomenon became known as the Bulgarian method for teaching of Aikido. He was elected member of the board of EAF at the EAF congress held in Sofia in 1995, and a vice president of the Committee for Development of Aikido in Europe. Ivanov Sensei died in a car accident together with his eldest son on 1st December, 1996. On 1st December, 1997 a delegation from Aikikai Hombu Dojo awarded “the father of the Bulgarian Aikido” posthumously with 4th dan. Having founded the Bulgarian and the Mongolian Aikido Federations, and having taught his love for Aikido to all of his students, Georgi Ivanov Sensei will always remain the unequalled leader in the history of the Bulgarian Aikido.